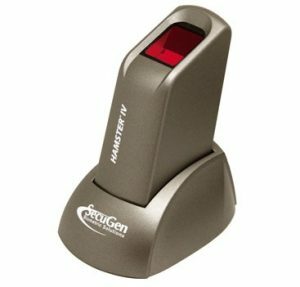 SecuGen Hamster IV is the FBI Certified addition to SecuGen’s popular and versatile fingerprint reader product line. Packaged in a comfortable, ergonomic design, Hamster IV features the industry’s most rugged and advanced optical sensor using patented SEIR fingerprint biometric technology. Use SecuGen Hamster IV together with SecuGen’s MINEX Certified Template Generator and Matcher to develop PIV-compliant applications that require fingerprint biometrics (now available in SDK Collection 11).